When the Utes fell to Washington on Saturday, Oregon was able to clinch the No.2 seed for next week’s tournament. Finishing second throughout the conference is nothing short of an astonishing accomplishment after all the drama that occurred in the offseason. Plus, Oregon was predicted a few weeks ago to only be having a 21.2 percent chance of actually making the tournament. Buckle up folks because the Ducks are proving the doubters wrong! As shown above, the Ducks are granted a first round bye and will thus have an extra day to prepare for their match-up against either Oregon State or Colorado. 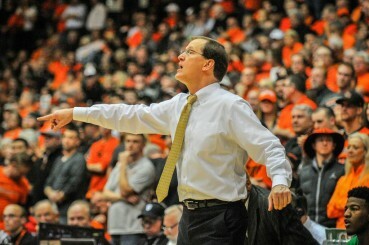 Altman coaching his team during the 2015 edition of the Civil War, which took place in Corvallis, OR. So far this year, Oregon is undefeated against both Oregon State and Colorado. In this case, the favor is obviously in the Ducks as they’ve shown since the beginning of the season that miracles can happen. Yes, that’s right I said miracles. What head coach Dana Altman has done this season has been nothing short of something found only in movies. He took a group of guys who practically never played together and found a way to make them play together. Twenty three games folks, my hat truly goes off to Altman and what he’s done for the Oregon’s basketball team this year. With that being said, it’s safe to say that the Ducks are in a great position now. However, they shouldn’t take the foot off the gas pedal and celebrate after a great regular season. Let’s go for it! Chasing and hopefully, beating the national champion is ultimately a stretch. But, the Ducks are not about losing. We want to “Win The Day”, and Oregon will certainly do that as March Madness slowly approaches.